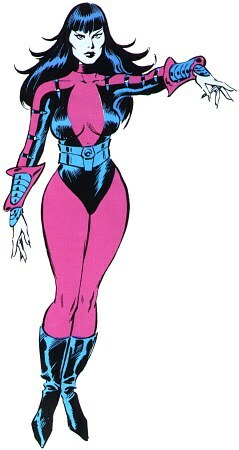 Nebula has no super human powers although she has above average strength, agility and endurance. Nebula has her own set of lieutenants. Wrist Blasters: Nebula has a set of wrist blasters that fire plasma bolts. Sanctuary II: Nebula briefly controlled Sanctuary II, This starship has 10,000 crewmen of various species. It is armed with hundreds of energy weapons. The Ship is propelled by a star-drive (lightspeed) and a hyperdrive capable of instantly moving it anywhere in the universe (within 1100 days). The hanger deck holds hundreds of fighter craft (13 crew each) armed with Plasma Generation guns. Little is known about the life of Nebula before the time she hijacked Sanctuary II, the solar-orbiting satellite built and used as a base of operations by the mutant Titan named Thanos, whom she claims to be her grandfather. Over the hundreds of years of his existence, it is probable that Thanos took many mates and consorts. Nebula is apparently the daughter of one of Thanos's sons or daughters. Her father and mother remain unidentified. A short time after Thanos became permanently transfixed between life and death, Nebula sent a small band of her most trusted aides to Sanctuary II to repair its hyper-drive engines and teleport the station out of the solar system.